EWG’s Skin Deep® Cosmetics Database is the world’s largest safety reference tool for personal-care products. EWG has launched this app to provide you with easy-to-navigate safety ratings at your fingertips for a wide range of products and ingredients on the market. Americans’ frequent exposure to cosmetics and personal-care products raises questions about the potential health risks of the myriad under-assessed ingredients they contain. These ingredients end up in the bodies of nearly every American. When you know what chemicals are in the products you bring into your home and how they may affect your health and the environment, you can make informed purchasing decisions — and help transform the marketplace. 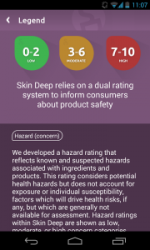 This Skin Deep® app has information and online safety assessments for more than 72,000 personal care products, 2,500 brands and 9,000 ingredients, culled from product labels and from the scientific and industry literature. To calculate a product score, we tally the hazards of each ingredient and evaluate every product in relation to all the others in Skin Deep®. The safest products score well by both measures: a low hazard rating AND fair or better data availability. EWG’s ratings are the best available information you can find on the safety of personal-care product ingredients.